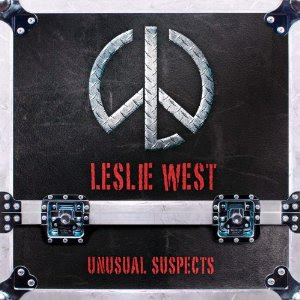 I just received a copy of Leslie Wests new recording, Unusual Suspects. The release is well put together and has all the pyrotechnics expected from a Leslie West recording. I don't know how many of you have been keeping up with West's recent releases but his last 4 or 5 releases have been primarily blues recordings and really spectacular. West has a great voice for blues and of course then there's his guitar tone!! Alas no videos from these releases so I'm happy to be able to finally present you with some real footage!! This release is more rock in nature but still has the blues overtones and plenty of guitar to go around. Leslie West, Legendary guitarist and the founder of one of rocks most influential bands, Mountain, will release a brand new solo album, 'Unusual Suspects', on Monday September 19th. The album features West alongside a hand-picked line-up of the world's finest guitar players; including Slash, blues-rock guitarist Joe Bonamassa, Black Label Society front man and ex-Ozzy guitarist Zakk Wylde, ZZ Top's Billy Gibbons and Toto's Steve Lukather. Released by ProvogueRecords, the album follows the shocking news that, in late June, West underwent life-saving surgery, when his leg was amputated above the knee. While such an ordeal would surely deter lesser artists, West insisted on honoring the 'Unusual Suspects' album’s September release date and is gearing up for a US tour in October. If you like your blues with a flavor of rock you'll wanna give this a listen and if you want hot nasty blues that screams make sure that you catch one of his most recent releases. They are all killer! This is the new Jay Gordon release...I think you'll like it!